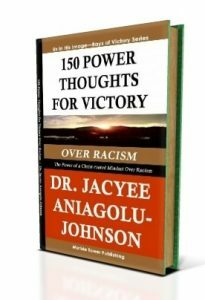 This book, 150 Power Thoughts for Victory Over Racism, is based on God’s Holy Word, the Bible. The Power Thoughts in this book are Christ-rooted winning thoughts for your individual victory over racism. These simple yet power thoughts will rewire and refocus your thoughts positively and position you in Jesus Christ to take a victorious stand against racism. Positive spiritual, steadfast resistance is what overthrows the foul spirit of racism. You are well established in Jesus Christ (1 Corinthians 1:30; 2 Corinthians 1:21) to defeat any form of racism that is directed against you.